Content Station contains many features, most of which are accessed by using an Application: a tool for performing a specific task. All Applications that you have been given access to are shown in the Applications pane on the Home page, but they can also be accessed through the File menu or the Tabs menu. 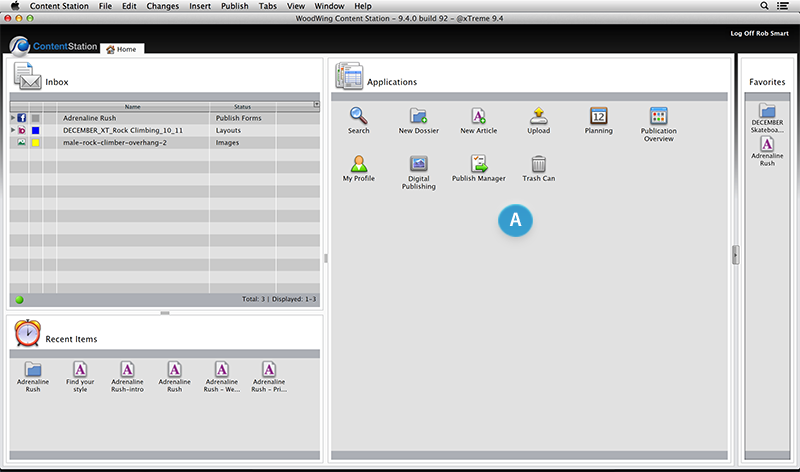 Figure: The Applications pane (A) on the Home page. To use an Application, double-click it on the Home page or choose it from the File menu or Tabs menu. The files that you work on in Content Station are by default stored in a database in the Enterprise system. The Search Application lets you search that database to locate any files that you want to use. For more information, see Searching for files using Content Station 9. Each story is represented by a Dossier. The New Dossier Application lets you create such a Dossier from scratch. For more information, see Working with Dossiers in Content Station 9. Used for creating a new article from scratch. For more information, see Creating a new article in Content Station 9. Used for uploading files to the database in the Enterprise system. For more information, see 'Uploading files to Enterprise with Content Station 9. Used for planning current and future publications within a Brand. For more information, see The Planning Application in Content Station 9. Publication Overview Provides a general overview of how far the production process of a Brand has progressed. For more information, see The Publication Overview Application in Content Station 9. My Profile This Application lets you change your password. (Content Station AIR only). Used for managing and preparing publications that are published to Adobe DPS. For more information, see the Digital Publishing Tools User Guide. Provides an overview of the stories that are published and not yet published and lets you manage them by changing their properties, routing them to other users, and more. For more information, see The Publish Manager Application in Content Station 9. When users delete files they are first moved to the Trash Can. The Trash Can Application lets you restore these files or delete them permanently. For more information, see Deleting and restoring files in Content Station 9. Typically, Dossiers are created from templates. Those that are used most often can be added to the Application pane on the Home page for easy access. For more information, see Adding Dossier templates to the Home page of Content Station 9'. Links to often used Web sites can be added as an Application for ease of use. For more information, see Adding a Web site as an Application to Content Station 9. Links to Enterprise Server installations can be added as an Application for ease of use. For more information, see Adding Enterprise Server as an Application to Content Station 9. Reporting Basic reports are available within Enterprise. A link to an application that is installed on your system can be added to the Home page so that it can be easily and quickly opened. For more information, see Adding applications installed on the system to Content Station 9. Elvis 4 / Elvis 5 When making use of WoodWing Elvis 4 or Elvis 5, the Elvis Application can be added to the Home page for easily accessing and searching files that are stored in that repository. For more information, see Adding Applications to Content Station 9. Some Applications may be used by certain users only. Depending on your role, your system administrator may have restricted some Applications from use by you. When in doubt, contact your system administrator.